The Australian Communications and Media Authority (ACMA) has released the latest findings in its regular research program designed to update its understanding of the Australian consumer experience concerning unsolicited telemarketing calls. A summary of the results was presented at the AMSRS Victorian Division end-of-year event in Melbourne on December 10, 2018. Speaking at the event, Fiona Cameron, a full-time authority member at ACMA, raised significant concerns about the number of Australians who expressed confusion about how or if their consent was obtained to receive telemarketing calls. One reason why landlines are targeted more than mobile numbers is that they are much more likely to reach elderly and vulnerable respondents – a better scam target market. The ACMA research showed discomfort amongst the Australian population with the accessibility of their contact information: 58 per cent of respondents reported that they did not have adequate control over who can access their details (34 per cent ‘strongly agreed’ with this and 24 per cent ‘somewhat agreed’). • 79 per cent had received an unsolicited call to their mobile phone. Landline users reported receiving four unsolicited calls on average in the past week, while mobile users received 2.3 calls on average in the past week. More than three quarters of people surveyed (77%) do not answer calls from unfamiliar phone numbers on their mobile numbers. Respondents said that the most effective way of avoiding unsolicited calls was for the telecommunications provider to block the calls on their behalf. The ACMA research found the top three unsolicited call categories were scams, telemarketing and charities. 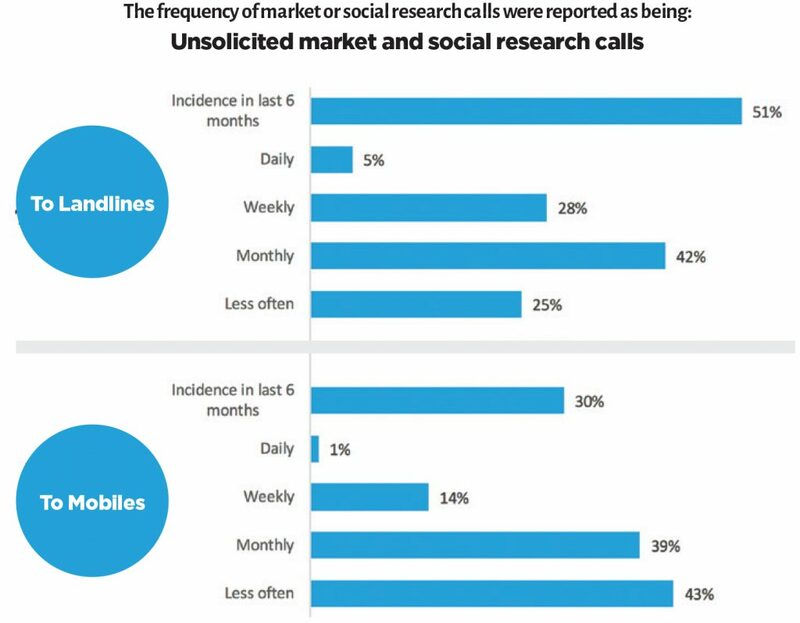 Market and social research rated as the fourth most prevalent form of unsolicited call – reported by 51% of landline users and 30% of mobile users over a six-month period. 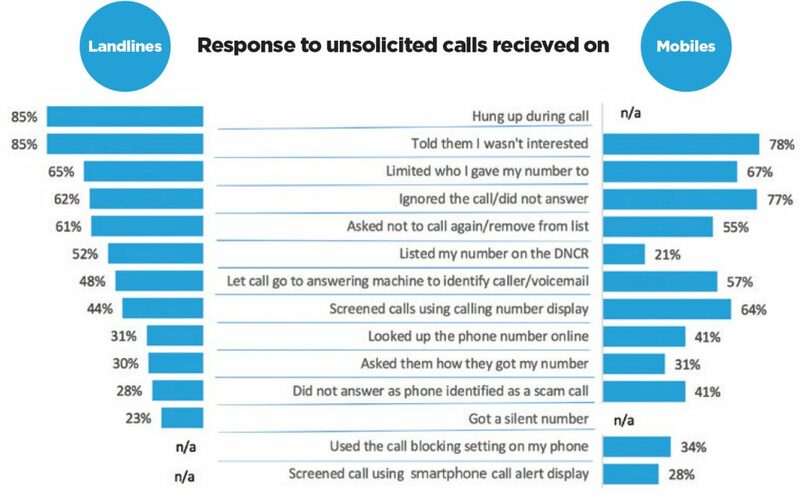 The ACMA research asked respondents what they did when they received an unsolicited call, eliciting the following responses for calls to landlines and mobiles. It is apparent that respondents rarely allow the communication to progress to the point where they even find out the purpose of the call. For instance, less than a third of respondents asked how the caller got their number – most respondents either did not accept the call or terminated before getting to that point. There is a difference between landline and mobile responses – landlines appear to be more likely to be answered, but the respondent typically hangs up (85%). Conversely, with calls to mobile phones, the opportunity to conduct a survey with the respondent was mostly lost (77%) before the phone was answered – recipients are using call screening or taking the opportunity to search for the number online before accepting the call. Where did you get my number? The ACMA research found that three quarters (77%) of the Australian community were aware of the Do Not Call Register (DNCR), but that this was significantly less amongst younger respondents – just 51% amongst of those aged 18-24 years of age. Two thirds of landline users reported that they had registered on the DNCR, as compared to 23% of mobile users. Fortunately, the market and social research industry fares relatively well in the research findings. In addition to this research, Cameron reported that there are only a small number of complaints to ACMA related to market and social research, and that these typically relate to calling times. The only concern that ACMA raised about the market and social research industry was with regards to of lead generation in the process of research. ACMA stated that they would be very concerned to learn of any calls conducted as market or social research that had a lead generation component.